The Aerodynamics Research Laboratory is a part of the Center of New Technologies (CNT). As part of its activities it conducts scientific and research & development work related to applied aerodynamics, which is unique both in Poland, as well as on global scale. The laboratory operates 5 wind tunnels, which includes the largest and the fastest wind tunnels in the Central-Eastern Europe. The center has one of the world’s most advanced research infrastructure in terms of applied aerodynamics . Upgrade works implemented in the Laboratory, have been introduced in response to international market demand in the area of fluid mechanics and sophisticated requirements of economic and industrial sectors. The Aerodynamics Research Laboratory employs highly qualified personnel with technical skills and expertise necessary for proper delivery of all works. The mission of the Aerodynamics Research Laboratory is to provide top-class research services for the international scientific research market. Since 22nd October 1997, the Applied Aerodynamic Laboratory has the Accreditation Certificate no. AB 129 issued by Polish Centre for Accreditation . 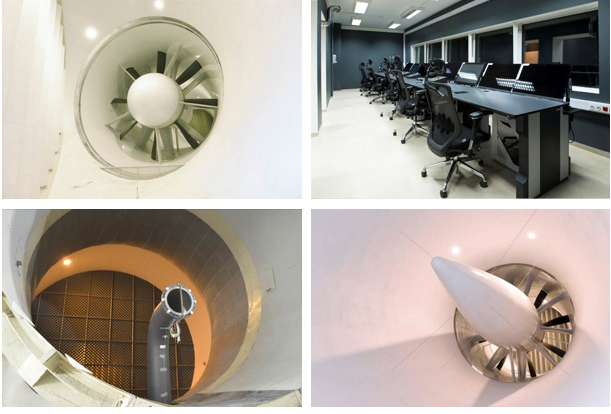 Upgraded in 2015, this low-velocity wind tunnel is a closed-loop tunnel, with an open measuring space, which has 5 meters in diameter and is 6.5 meters long. Dimensions, engine power (5.6 MW) and wind speed (90 m/s) place this tunnel among world’s leading low-velocity wind tunnels. Additionally the wind tunnel is equipped with an innovative IPW400 and IPW80 secondary flow systems generating additional air flows, with the maximum mass flow rates of 45 kg/s and 2 kg/s, accordingly. The IPW80 system allows also the medium temperature to be raised to 250oC. This unique system permits testing of aircraft engines’ internal components or their models under simulated takeoff and landing conditions and in increased exhaust gases temperatures. These tests are performed on models of aircraft and helicopter parts (fuselages, rudders and stabilizers, main and tail rotors), buildings, navy ships, cars, trains and two-dimensional profiles. 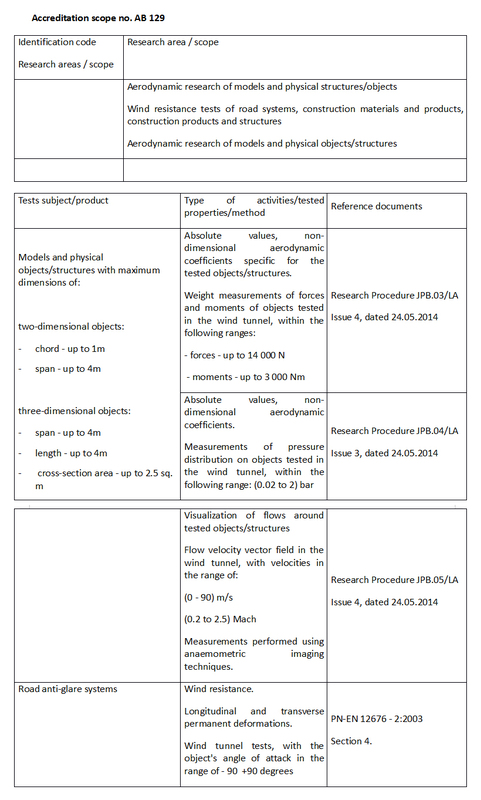 Tests involving measurements of dynamic stability, aeroelastic model deformation and laminar flow parameters are also performed. 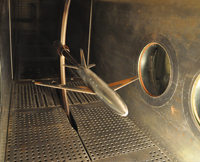 The wind tunnel allows testing of aircraft models with wingspans up to 4 m, non-aircraft models, which generate aerodynamic drag (residential and public buildings, bridges, industrial structures) with heights of up to 3 m and cross-section area (perpendicular to the flow direction) of up to 2.5 sq. m and models of rotors up to 3 m in diameter. For tests not related to aviation, a special flat plate is installed in the measuring area. Correct velocity and turbulent airflow profiles are achieved by relevant modifications of this plate surface. 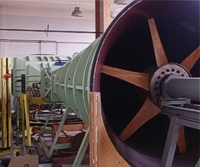 The Trisonic Wind Tunnel is in operation since 1965. The tunnel is a blow-down type with partial recirculation of the flow and can be operated in all three regimes, subsonic, transonic and supersonic. Mach number can be changed in range M = 0.2 – 2.3. The tunnel is supplied from two spherical compressed air tanks with the combined volume of 2880 m3 and maximum pressure of 6.5 atm. The air is compressed using two 2000 kW centrifugal compressors and is appropriately purified and dried. for low subsonic Mach velocities (0.3 – 0.5 Mach) – for over ten minutes. Measurements are performed in a measuring chamber with the diagonal cross section of 0.6 x 0.6 m, which makes this wind tunnel one of the largest and fastest facilities of this type in Poland. unsteady pressure measurements with control and actuation mechanism for flap and profile oscillations. CTA tests or a flow visualisation (smoke, oil or PIV). The tests may concern laminar airfoils, airplanes, helicopters, ships or any other object which require low turbulence of the airflow. 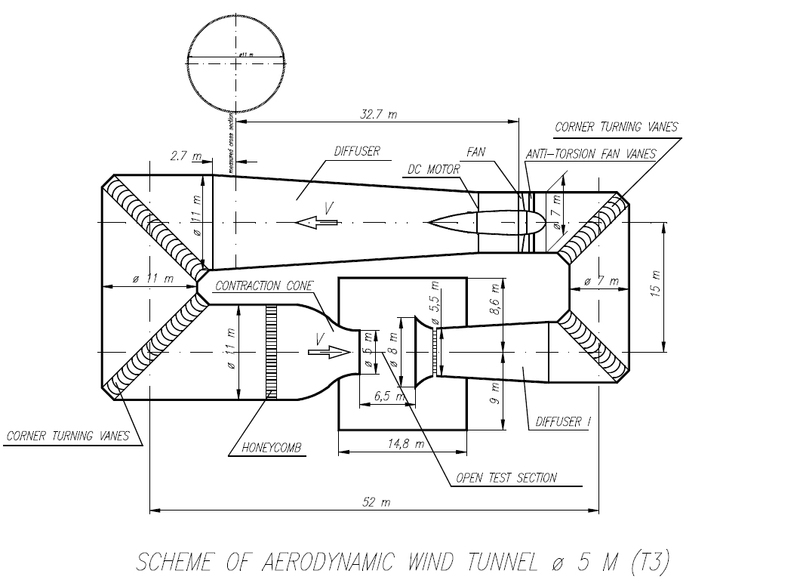 The Supersonic Wind Tunnel is a blow-down type with a closed test chamber of 0.15 x 0.15 m. The velocity range is M = 1.22 – 3.5. The tunnel is used for research on aerodynamic phenomena related to supersonic flow like: boundary layer interaction with a shock wave.